Do this 1 thing to feel great this summer. Yes, I know what you are thinking…: Hear we go again. Someone telling me to drink water. Whoopdido! NEXT!!! And yes, you are right, I will tell you to drink enough water, but I also hope to tell you a few new things about dehydration, how to spot whether you may be dehydrated or not, and how to help your body to properly use the water you gobble down, instead of just increasing the number of toilet runs. The human body of an average adult consists of around 55-65% of water, depending on whether male or female, and also fat mass to lean mass. The more fat mass the less water. 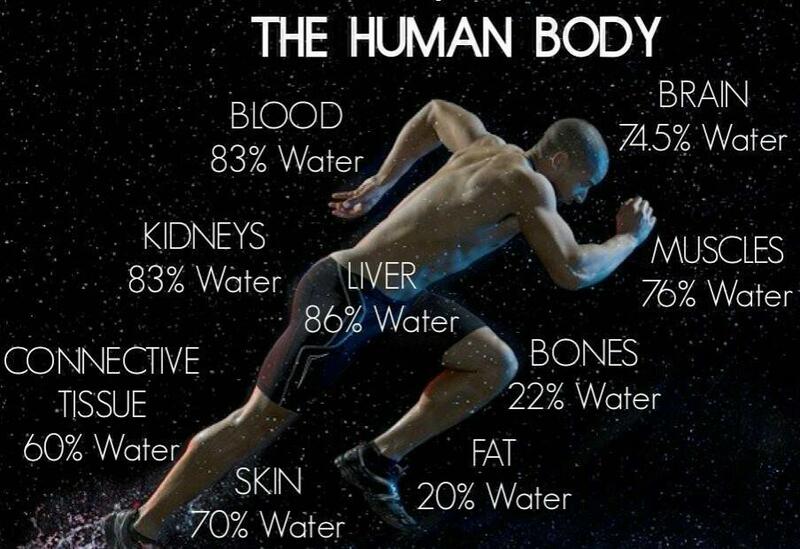 The picture here shows how that percentage is than split in regards to separate systems in the body Looking at those numbers, I wonder how come that most people suffer to drink enough water throughout their days to ensure proper hydration of their temple! I always get asked: What is the reason I feel so tight or sore? And one of my answers is always: It can simply be dehydration. Imagine you buy a piece of meat from the butcher and you let it sit in the sun. Beside it going off rather quickly you would be able to see how the tissue dehydrates, how the fibers become imporous and brittle. They become less elastic and stiffen up. The wrinkled skin in older people is partly caused by less water in the tissue. The reason most cosmetic creams give a younger appearance for a short period of time, is because it has re-hydrating properties to the skin. So guess what, what happens to the piece of meat out in the sun is what happens to your tissue on the inside. And even though not to this extend, but enough to give you grief. So how can you tell, if it may be dehydration that is the cause of your problem? Often by the time we feel there is a problem, other factors are lying on top of the dehydration issue, and to find a solution for the issue becomes more and more complicated. A lot of the times we simply do not drink enough or the wrong kinds of fluid, like coffee, tea, or worst, soft drinks etc. Sweating is another factor. Particular in the hotter months we loose a lot of fluids through our skin. But also fevers, vomiting and diarrhea, or urinating too much (uncontrolled diabetes or some medications) can lead to dehydration. Dehydration goes in stages from mild to moderate to sever, which is life threatening. You can also be over hydrated which is also dangerous, but to get to that stage is much much harder than to go the other way. Anyhow, here is a list of signs and symptoms that can be caused by dehydration. I will also list sever dehydration , even though we will focus on the mild to moderate kind. Whenever you feel hungry, drink 250-400ml of water first, than wait 5-10 minutes. You may be surprised how often the feeling of hunger is confused with thirst. I am afraid that there is enough evidence out there to support that water is your optimal choice for hydration. Caffeinated, sweetened and alcoholic drinks pack chemical cargoes (or trigger chemical reactions) that demand significant amounts of fluid to properly process and filter. As a result, non water beverages can actually set you back, water-wise. 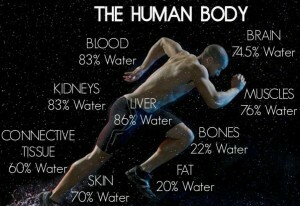 They can actually dehydrate the body. Drinks like coffee and black tea are very high in purines, toxins that must be diluted in large quantities of water to be flushed from the body. Moreover caffeine found in coffee, black tea and soft drinks adversely affects your body’s water stores because it is a diuretic that elevates blood pressure, increasing the rate of both the production and elimination of urine. The travel rate of the water content of those drinks is much to high. The kidneys remove a big chunk of the liquid before it can penetrate into the intracellular level (more about this later). However, water alone will not do the trick either. Apparently we do need minerals and vitamins for proper absorption of the fluid into the cells, not just their environment. Here coconut water is awesome as it comes with a super load of electrolytes, but in general, just eat your fruit and veg and you will be fine. Bottom line, coffee first thing in the morning sets you of to a very rough start. You are already lacking fluids, because you have not been drinking for the whole time you were asleep. And then you add coffee which will in turn make you excrete even more water….At least have a good 1/2 liter of just pure water before you have your coffee. To tell the truth, there is no 1 answer. It depends on your body and your circumstances only. My belief though is that 8×8 ounces (about 1.6 liters) of water is not anywhere near enough!!!! Simply my experience from myself as well as clients. Aim for a minimum of 2 liters a day, better more. Going with the above points eating high water loaded foods will hydrate us to some extend, so you could eat more and drink less. However, the more dry stuff you eat (processed foods, crackers, powders of any sort, even meat) the more you need to drink as the fluids are needed to help break this stuff down. The dryer something is the more water it will soak up whilst traveling through your digestive tract. You need to learn to listen to your body, read the signs and symptoms. Your lips getting dry, you are getting tired/lethargic for no reason, your urine is getting darker…. My best tip is to carry water wherever you go, so as soon as you feel the urge to wet your lips you have the right stuff right there. Our body consists of tubes. The digestive tract is a tube, our bones are tubes (they are kinda hollow inside), our blood vessels are tubes, our lymphatic system is a tube system. Now, the blood vessels transport nutrients and liquids through the body, as well as waste products. So does the lymphatic system. The circulatory system though has a pump (heart) that helps to move everything through. The lymphatic system needs the surrounding connective tissue (muscle and fascia) to press against it to create a pulsating motion to move things along. Imagine a person who sits down a lot, or is in any stationary position for a lengthy period of time. First up: When we sit we create a lot of angles…and just like a kink that got created in a hose for example, those angles will make it very hard to let the liquids and other stuff pass through the blood and lymph vessels. Second: When the soft tissue is not contracting and releasing, therefore, does not create a pulsating motion, nothing will move through the lymph system. By keeping mobile and active we assure proper transport of liquids into the intracelluar space, as well as back out again. Out of the minimum of 2 liters of water per day, have 1 liter whilst walking, or at least standing, followed by walking or even better mobilizing. Mobilizers are designed to unglue the fascia. By combining mobilizers with hydration you kill 2 birds with 1 stone, so to speak ( I do not like writing this, but I am not aware of another phrase for this situation). Well, I hope you found some new info here, and maybe got some more inspiration to give it a go and drink more of that precious water. Life appeared in water first, hence water is essential to live. Yep, with the hotter weather, drier air and much increased respirational loss, even from air-con cool air, keep drinking!